We drove up to Kelowna over the weekend to check out the opening and awards ceremony for the Art Visions 2009 show and it was totally worth the drive, although the cold weather was a little much, -10, yikes! 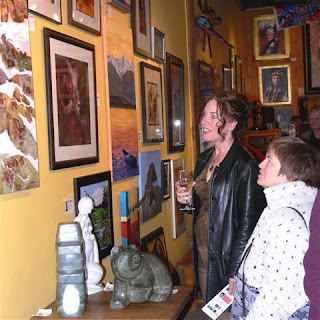 This photo was takend by photographer Maryann Hendriks AFCA at the Turtle Island Gallerywhere my painting is hanging, just above the painting we are looking at ;) I will upload photos below of my painting that my hubby took. It is a really cool gallery with aboriginal art and sculptures. Great photo! Glad you had a good time -- but was it really -10? Yes I even had to check the temp stats because I started 2nd guessing myself and it was -10.7C! Isn't that crazy, that is colder than in Dec there normally.